Protein is one of the three macro-nutrients (the other two being carbs and fat), and it can be argued that it is the most important. It is highly filling, helps with weight maintenance and is needed for repairing and building muscle tissue. Nuts and seeds are excellent foods to add to your diet. Not only are they bursting in essential micro-nutrients, they are also a source of each of the 3 macro-nutrients, containing large amounts of protein, complex carbs and healthy fat. That said, it is important to keep in mind that nuts are not a complete protein source, which means they do not provide all of the 9 essential amino acids needed by the body. Because of this, it is a good idea to include other protein rich foods in your diet. Below are 15 nuts and seeds that have the most protein. An ounce of almonds (which is around 23 whole kernels) will provide the average adult with roughly 12% of their daily protein requirement, which is an impressive amount. However, this study found that almonds are low in the amino acids lysine, methionine and threonine, which means they are not a complete protein source. Almond butter (which is prepared by grinding almonds down to a paste) is very popular and widely available. If you have a powerful food processor, you can also make your own fresh batch at home. Pumpkin seeds are one of the highest sources of protein when compared to other seeds. A one cup serving will provide you with 12 g of protein, 12 g of fat, 34 g of carbs (12 g of which is fiber) and 285 calories. Pumpkin seeds are also rich in iron, magnesium, potassium and zinc. You can enjoy pumpkin seeds in lots of different ways; roast them with herbs & spices, add them to soups & salads and include them in homemade trail mix. Just like is the case with most other nuts and seeds, sunflower seeds are chock-full of vitamins and minerals. Sunflower seeds are one of the best sources of vitamin E, which is needed by the body to repair damaged skin, improve vision and prevent disease. Sunflower seeds don’t have an overpowering flavour, making them a good protein source for smoothie recipes like this one. Pistachios have got to be one of the most tasty and addictive nuts out there; once you start eating them, it is difficult to stop. Because of this, it is important to keep an eye on how much you have eaten, especially if you are watching your weight (50 pistachio kernels have around 160 calories). If you are bored of eating pistachios on their own, you may want to try out this healthy ice cream recipe made using dates, frozen bananas and pistachios. Sometimes also referred to as linseeds, they are the best whole food source of alpha-linolenic acid (a type of omega-3 fatty acid). Including adequate amounts of omega-3 rich foods in your diet helps to reduce inflammation, improve heart health and boost immunity. Because of their small size, it is very easy to add flax seeds in all kinds of dishes. You can sprinkle them over oatmeal or cereal, make homemade protein rich breads and wraps or add them to yogurt. Another super delicious nut, cashews are native to Brazil and are enjoyed worldwide. They are commonly used as an ingredient in Thai, Chinese and Indian recipes. Cashews are also very popular among vegans, being used to prepare dairy free cheese, which is eaten as an alternative to regular cheese. Nutrient wise, cashews are high in protein, monounsaturated fat, magnesium, phosphorus, manganese, the B vitamins and vitamin K.
If you are unable or choose not to consume dairy, sesame seeds are an excellent source of calcium, with an ounce serving providing you with around a quarter of your daily requirement. It is well-known that calcium is needed for bone health, but it also plays a role in blood clotting and weight maintenance. Tahini is a tasty paste made using sesame seeds, oil and salt, which is then used as an ingredient for preparing hummus, a protein rich dip that can be eaten with pita bread, carrot sticks or just on its own as a filling snack. Besides protein, chia seeds contain a lot of dietary fiber. 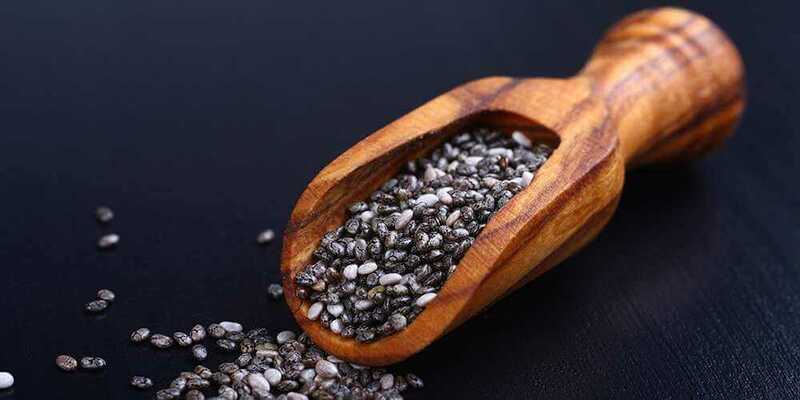 When water is added to chia seeds, a lot of it is absorbed by the fiber to form a thick gel like substance, which increases fullness and slows down the movement of food in the digestive system. This combined with the high satiety of protein means chia seeds may be beneficial for weight loss. These seeds are often used to prepare chia pudding, which makes for a filling, nutritious and delicious breakfast option. It is often said that walnuts look a lot like the human brain, which is highly fitting because studies have shown that walnut consumption may improve cognitive performance. Walnuts also have cancer fighting properties, improve heart health and are a source of powerful antioxidants. The most common way to eat walnuts is as a snack on their own, but you can also use them to prepare walnut sauce, snack bars, breads and desserts. Some interesting facts about hazelnuts: more than 60% of the world’s hazelnuts are produced in Turkey, and Ferrero (the company that manufactures Nutella) is the world’s biggest buyer. Worry not though, you should be able to find plain hazelnuts at your local grocery store. Hazelnuts have a similar nutritional profile to most other nuts, being a source of vitamin E, calcium, iron, magnesium, potassium and manganese. A 1 ounce serving will provide you with around 8% of your daily protein requirement. The Brazil nut tree is found in the Amazon; it grows to over 150 feet in height and can live for 500+ years. Because of its size, a single tree produces large quantities of Brazil nuts. Brazil nuts contain a lot of selenium, with a 1 ounce serving providing you with more than 700% of your daily requirement. Selenium is a mineral that is needed by the body in very small quantities; it works together with iodine and plays an important role in maintaining thyroid health. A 1 ounce serving of pine nuts has 188 calories, 3.7 g of carbohydrate, 19.1 g of fat and 3.8 g of protein. This study carried out on rabbits found that pine nut consumption helped to reduce cholesterol levels. Pine nuts may also help to lower blood pressure, improve eye health and lower the risk of certain types of cancer. Pine nuts are usually enjoyed toasted. You can either purchase the ready toasted variety or toast them yourself in the comfort of your home. 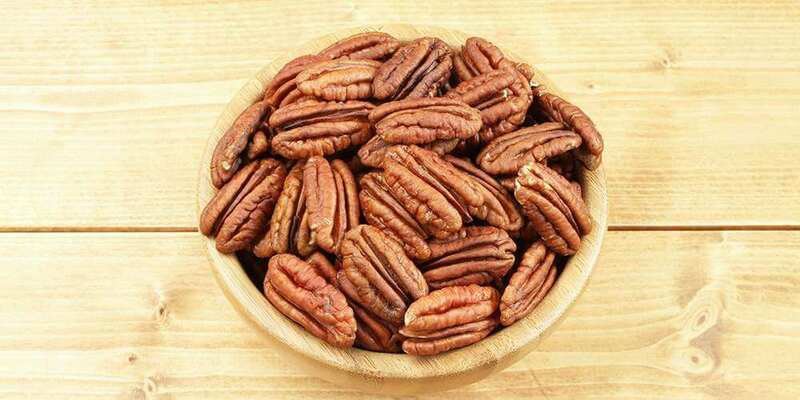 None of the nuts or seeds mentioned in this article look alike, and this is certainly also the case with pecans – it is easy to identify them with their distinct shape and deep brown colour. Pecans have less protein than other nuts like almonds and cashews, but they are still very nutritious. Pecans are well-known for being an ingredient used to prepare pecan pie. If you want to make your own, give this easy to follow recipe a shot. Just make sure not to overindulge, especially if you are watching your waistline! Of all the 140 foods shown in our healthy food finder tool, macadamia nuts are the most calorie dense. This is because they are made up of 75% fat, which has 9 calories per gram (compared to carbs and protein which have 4 calories per gram). The macadamia tree is native to Australia, but is also grown in Latin America, Africa and Asia, making the nut widely available. When buying these nuts, opt for the unsalted variety if possible. Peanuts are neither a nut nor a seed; they belong to the legume family, which also includes beans and lentils. However, peanuts are often consumed as a nut (they even have the word nut in their name! ), which is why we have included them in this list. Peanuts are the primary ingredient used to manufacture peanut butter, which like almond butter, contains a decent amount of protein.